Have you noticed that print has become one of the good guys? We’re not selling our data to the bad guys. We’re not setting up algorithms that only benefit our paying customers. We’re not slowing down access to those who can’t afford to get on the information superhighway. Print is good and decent. It’s fascinating to read posts by the digital gurus who list print (sometimes at the top of the list) as a way to reach customers in a trustworthy way. We’re trustworthy! Because print good and decent! It’s amazing to see developers want to create new ways to connect their technology to print. Because print connects with people. It’s good and decent! I love seeing people turn for their news to big newspapers and small that check their facts and put out honest journalism. Honestly, print is so good and decent. If you’re involved in making print, selling print or promoting print, this is the year to reach out to your tribes, your colleagues and even your print-indifferent friends and let them know that print has always been the one. 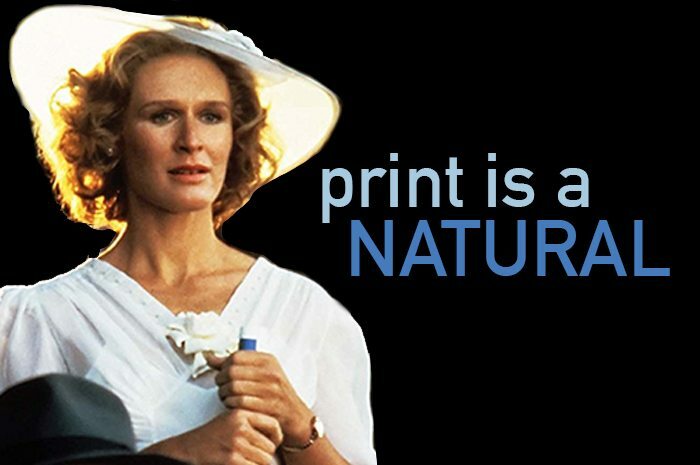 We’re like Glenn Close in “The Natural.” So good. So decent. And like her character, we really are the logical, enduring, smart choice. P.S. Polish up your image and get your messaging in order. Together let’s make the most of print — and why it’s great — in the coming year! Your blog is awe-inspiring.Very good post with useful information. Thank you – I really do think we in the industry have a responsibility to elevate printing. I appreciate your readership and comment!